George Lucas filmed various parts of his Star Wars series in the Tunisian Sahara desert, including scenes set on the planet Tatooine. The planet Tatooine has two suns and was the birthplace of Anakin Skywalker. 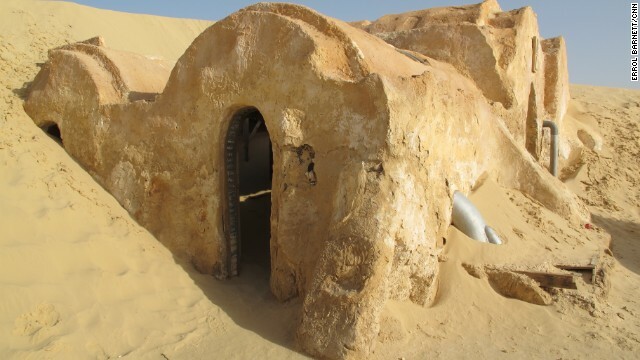 By request of the Tunisian government, the set for Anakin Skywalker's hometown Mos Espa was left intact in the Sahara desert. It is a pilgrimage destination for Star Wars fans from around the world, with Jedi Knight capes and lightsabers on display. The back of an old desktop computer and a PVC pipe make up the "futuristic" props attached to one of the dwellings. 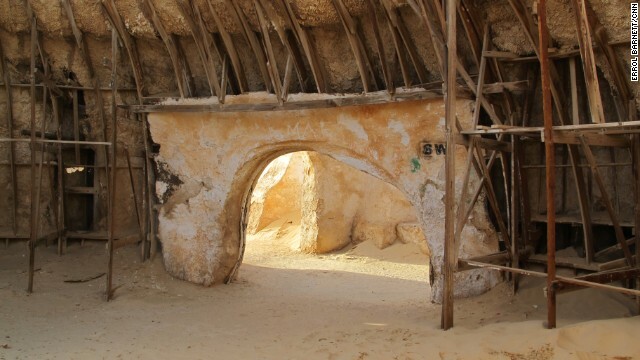 Take a closer look and you'll see that Mos Espa's homes are actually made from wood, metal mesh and plaster domes -- some without ceilings. Trips to the abandoned film set are included in hotel vacation packages. But surrounding sand dunes are beginning to engulf the set. Tourists need to act fast, if they want to see the set before it is covered by sand. Every week, Inside Africa takes its viewers on a journey across Africa, exploring the true diversity and depth of different cultures, countries and regions. Follow host Errol Barnett on Twitter and Facebook. 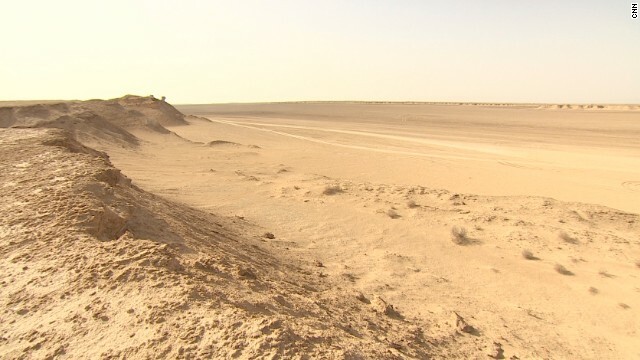 (CNN) -- Deep in Tunisia's Sahara desert is an abandoned settlement, part submerged by the sand, somehow alien, yet strangely familiar. The surrounding landscape looks like it's from another world, in a galaxy far, far away -- which is why movie director George Lucas chose it as a location for filming parts of his blockbuster "Star Wars" series. 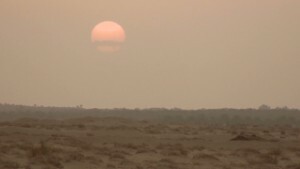 The Tunisian Sahara was transformed into Tatooine -- the barren planet with twin suns that was the birthplace of Anakin Skywalker, otherwise known as Darth Vader. 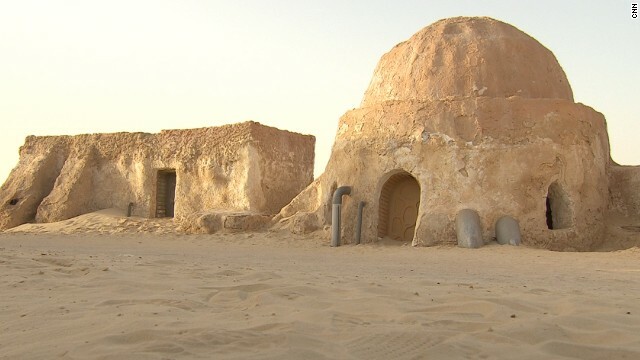 At the Tunisian government's request, the lavish set for Anakin's home town, Mos Espa, remains intact -- a beacon in the desert. 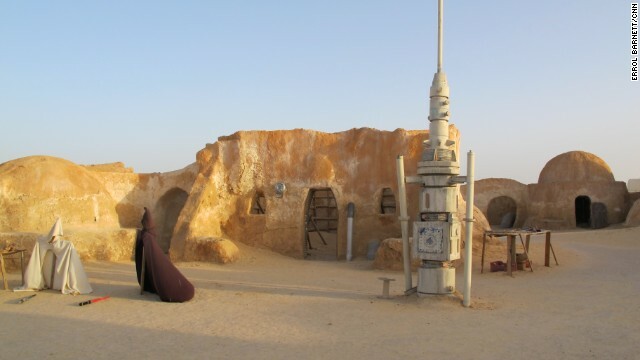 The set of 20 buildings, situated northwest of the city of Tozeur, covers an area of around 10,000 square meters and remains a pilgrimage destination for avid "Star Wars" fans from around the world. Former rally driver Tahar Karya is an expert at tackling the Sahara's sand dunes in his four-by-four. He was George Lucas's personal driver during the filming in Tunisia and has a personal attachment to the set. He believes that Lucas's decision to use the area in his film was a great boon for the region. "More than 1,500 background actors were employed. Agencies and hotels also benefited," he says. "Over a period of two-and-a-half months, (Lucas) brought activities to the region and beneficial economic activity. We hope he comes back here again." The crew faced difficulties dealing with the weather in the Sahara. Temperatures reached 135 degrees Fahrenheit (57 C) during filming, then production was slowed by a rare summer rainstorm. 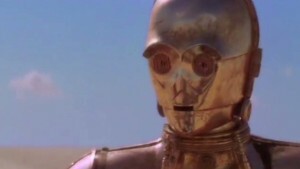 Still, facing scheduling and budget constraints, Lucas was able to get the scenes he needed, which appear in "Star Wars" movies "The Phantom Menace" and "Attack of the Clones." An alien homeland in Tunisia? But for those who want to experience this important piece of film history, time is running out. 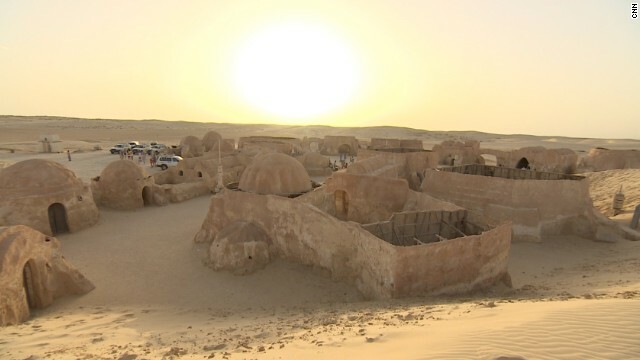 Although the set has withstood the elements for more than a decade, the desert's sand dunes are moving to engulf the fictional town. "Ever since they finished the part of the movie shot in 2003, sand dunes have surrounded the film set from every side. They should not have allowed this to happen," says Tahar. A team of scientists has tracked the movement of a large sand dune, which has already started to cover the set. it is moving at a rate of 4 cm per day and It won't be long before this alien town is buried beneath the sand. Like any desert Oasis, this one too will soon disappear. Each day tourists -- mostly from Europe -- arrive by the car load. 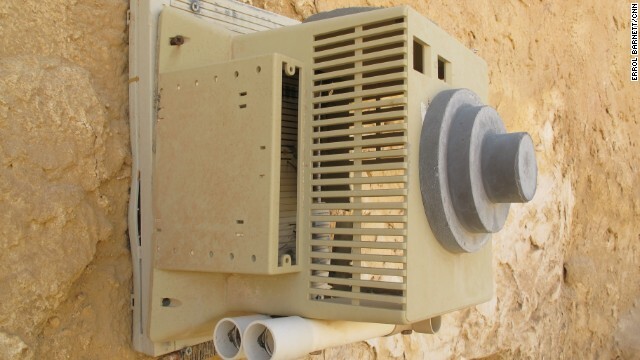 Trips to the abandoned film set are included in hotel vacation packages and it's one of the few things that will draw visitors into the baking-hot desert. What really matters to Tahar is that the tourists keep coming, especially because the country is struggling to rebuild its economy after its 2011 revolution. "Tunisia is a very beautiful and safe country," he says. "I advise the whole world to come visit Tunisia. Tunisia is a country of security, comfort, and stability ... Besides, in Tunisia there are more than 300 days of sunlight. This is a country where life is good!" As the sun beats down on the alien homeland, Tahar says he is proud to have been part of something iconic. 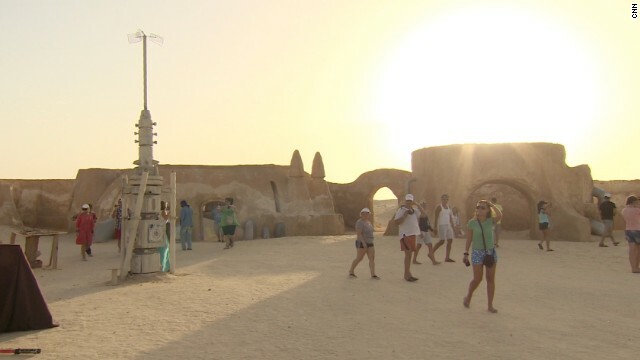 But fans who want to visit Mos Espa will need to act soon, before the Sahara Desert swallows it up.